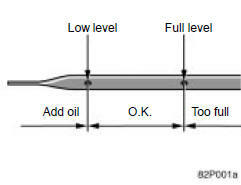 With the hybrid system at operatingtemperature and turned off, check theoil level on the dipstick. 1. To get a correct reading, the vehicleshould be on level ground. After turningoff the hybrid system, wait a few minutesfor the oil to drain back into thebottom of the engine. 2. Pull the dipstick out, hold the rag underthe end and wipe it clean. 3. Reinsert the dipstick—push it in as faras it will go, or the reading will not becorrect. 4. Pull the dipstick out and look at the oillevel while holding a rag under theend. Be careful not to touch the hot exhaustmanifold. Be careful not to drop engine oil onthe vehicle components. If the oil level is below or only slightlyabove the low level, add engine oil ofthe same type as already in the engine. Remove the oil filler cap and add engineoil in small quantities at a time, checkingthe dipstick. We recommend that you usea funnel when adding oil. For the engine oil capacity, see “Servicespecifications” on page 431. When the level reaches within the correctrange, install the filler cap hand−tight. Be careful not to spill engine oil onthe vehicle components. Avoid overfilling, or the hybrid systemcould be damaged. Check the oil level on the dipstickonce again after adding the oil. “Toyota Genuine Motor Oil” is used inyour Toyota vehicle. Use Toyota approved“Toyota Genuine Motor Oil” or equivalentto satisfy the following grade and viscosity. 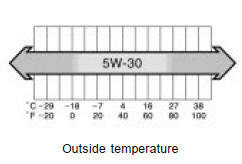 SAE 5W−30 is the best choice, for goodfuel economy, and good starting in coldweather. If SAE 5W−30 oil is not available, SAE10W−30 oil may be used. However, itshould be replaced with SAE 5W−30 atthe next oil change. The ILSAC (International Lubricant Standardizationand Approval Committee) CertificationMark is added to some oil containersto help you select the oil youshould use. To ensure excellent lubrication performancefor your engine, “Toyota GenuineMotor Oil” is available, which has beenspecifically tested and approved for allToyota engines. Please contact your Toyota dealer for furtherdetails about “Toyota Genuine MotorOil”.